By Kimberly Lochner, M.D., and Ahmad Slim, M.D. A 47-year-old man presented to the emergency room with recurrent episodes of left-sided chest pain that occurred at rest and were associated with shortness of breath, nausea, dizziness, and palpitations. Physical examination, EKG, and cardiac biomarkers were all normal. 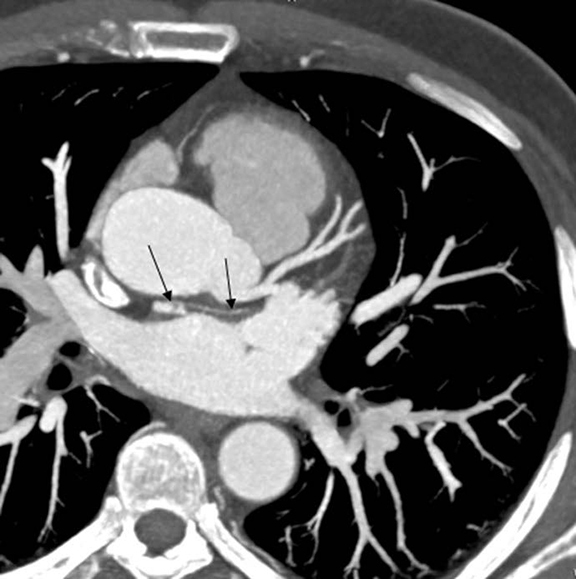 Cardiac CT angiography was performed, demonstrating a vascular connection or fistula (arrows) between the left circumflex coronary artery and the left atrium. The incidence of coronary arteriovenous fistulas (CAVFs) is approximately 0.1-0.2%. They typically drain into the right atrium, right ventricle, or right atrial-superior vena cava junction. Around 10% of CAVFs drain into left-sided cardiac structures; of these, approximately 80% drain into the left atrium. CAVFs can cause angina from coronary “steal”, as well as congestive heart failure, pulmonary hypertension, endocarditis, spontaneous rupture, or arrhythmia depending on the size of the CAVF, its origin, and the chamber in which it empties. Small asymptomatic CAVFs require no further treatment, but monitoring echocardiography can be considered. Large CAVFs, the presence of a continuous murmur, or symptomatic CAVFs should be closed by either a surgical or transcatheter approach. Lochner K, Slim A. At the Viewbox: Arteriovenous fistula between the left circumflex and left atrium. J Am Osteopath Coll Radiol. 2013;2(2):27. Kimberly Lochner, M.D., and Ahmad Slim, M.D. Dr. Lochner and Dr. Slim work with th Department of Cardiology, San Antonio Military Medical Center, San Antonio, TX.